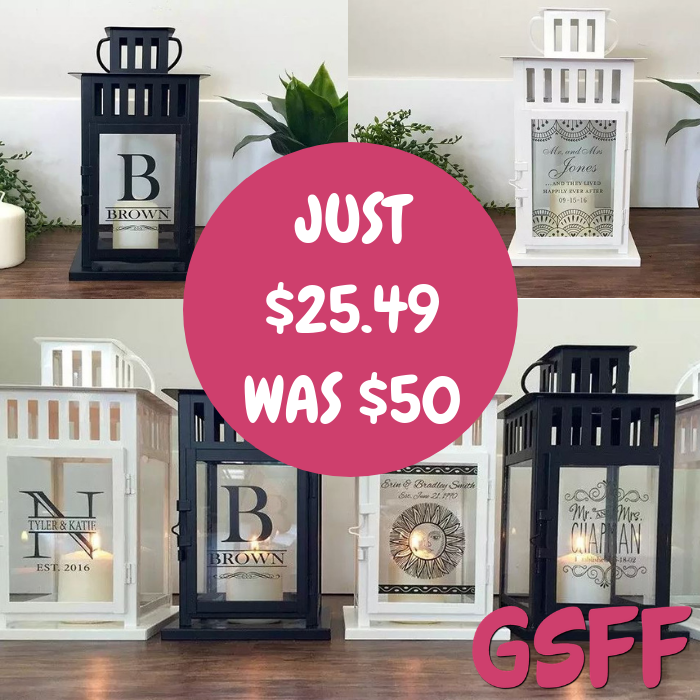 Personalized Candle Lanterns Just $25.49! Down From $50! Shipped! You are here: Home / Great Deals / Personalized Candle Lanterns Just $25.49! Down From $50! Shipped! At Jane, you can score these Personalized Candle Lanterns for just $25.49 down from $49.99 PLUS FREE shipping! These beautiful Personalized Lanterns are the perfect gift, and add a uniquely beautiful touch to your home. Each lantern is personalized especially for you. Choose from our large, exclusive designs – you’ll find the perfect one for you! These lanterns are perfect for newlyweds all the way to 100 years of happy marriage! Each lantern is personalized using state of the art UV Inks that will last a lifetime. Perfect for weddings, bridal showers, parents, friends, and especially you! Perfect for gifts & events! Each Personalized Lantern measures 6x6x11.